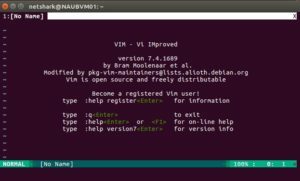 Vim Setup - D'Alfonso & Co.
Vi is the well known editor in Linux, and its Vim (Vi Improved) version is a friend of all professionals using Linux for daily tasks. What makes vi so good is the availability of a large number of plugins that make it incredibly useful, mainly for software development. Better, there are bundles of configurations available on github that give all what you need and something more. My choice was for the well known amix/vmrc available on github. Vi customization, again, can become an hobby, but we are looking to something to fulfill a production environment, so feel free to experiment, but this is not the goal. The main use in our case is for snippets of code to be be inserted while developing something. This could be done in a local configuration, and it should be done there, as the file could be overwrittten in some future update during the long 5 years maintenance period. I actually have to make only this change so if some day the syntax is wrong, it is clear what’s happening. Simply make again the change. Any group of snippets is in a file with “syntax”.snippets, this is relevant because for nasm is nasm.snippets not asm.snippets. Snippets are inserted entering the snippet name (here head) followed by TAB. ; * Copyright (c) 2016 by D’Alfonso & Co.
// * Copyright (c) 2016 by D’Alfonso & Co.